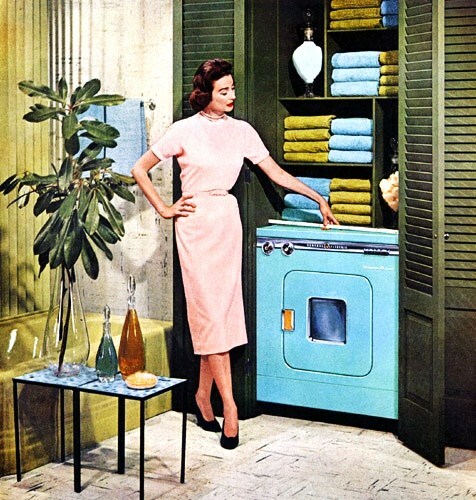 Farm Girl Pink....: ~ Vintage Laundry rooms.... with lots of color! 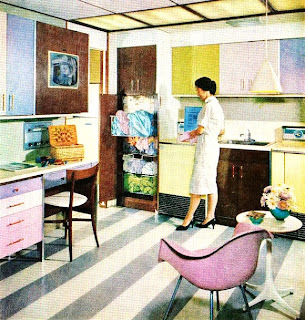 ~ Vintage Laundry rooms.... with lots of color! 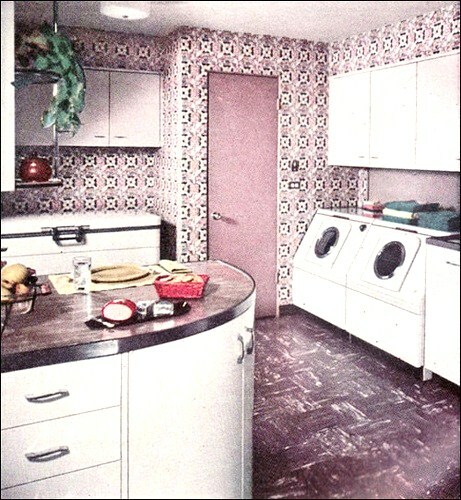 I am mesmerized by these vintage laundry rooms. 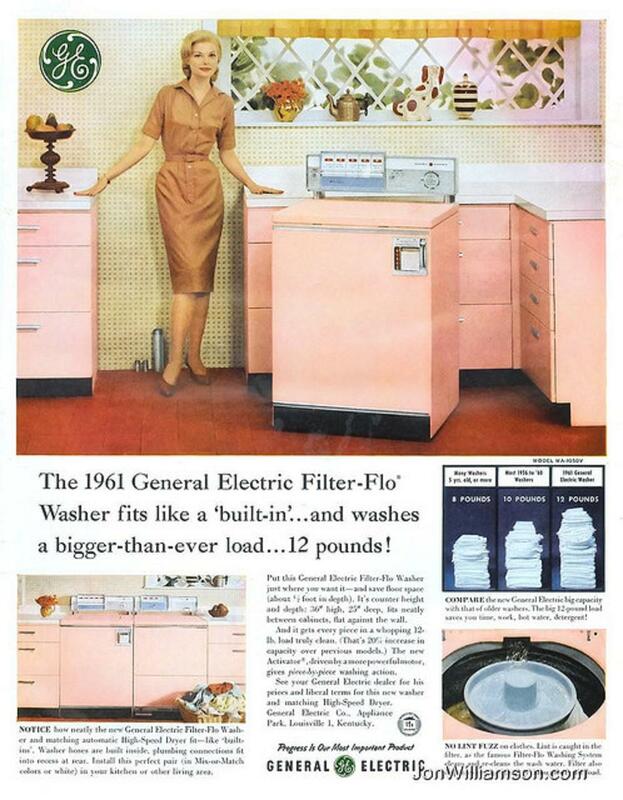 The more I roam around Pinterest looking at the vintage advertisements... the more I realize that the washer and dryer did not seem to be in their own little room, for decades. Our girl above, who is showing off an incredible turquoise washer, is actually in the bathroom. Look to the left of her and you will notice the avocado green tub. Which actually doesn't seem like a bad idea for placement of the washer. This has to be the best use of the color, lilac, I have seen so far. And we are back in the kitchen and laundry room combo. There is even a deep freezer in this room too! Then there is that fabulous lilac wallpaper... that is a great addition to a room filled with white appliances. Now this has to be the most square footage, I have seen for a laundry room in these older advertisements. And then the use of so many colors, with those great mid century modern chairs! This is a fantastic room. Now this is my idea of heaven. 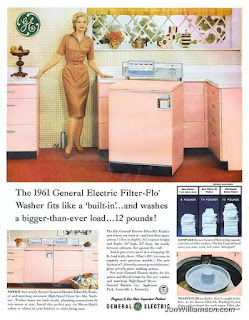 Matching General Electric washer and dryer in pink... sitting in a laundry room filled with vintage pink steel cabinets! ~ Easter Goodness.... Pink Apron Happiness! ~ Random things.... Link Party for Treats! ~ New pink Jennyware Shakers! ~ Crinoline and Moderntone.... the Pinks! ~ Let's look at some Yellow and Green goodness! 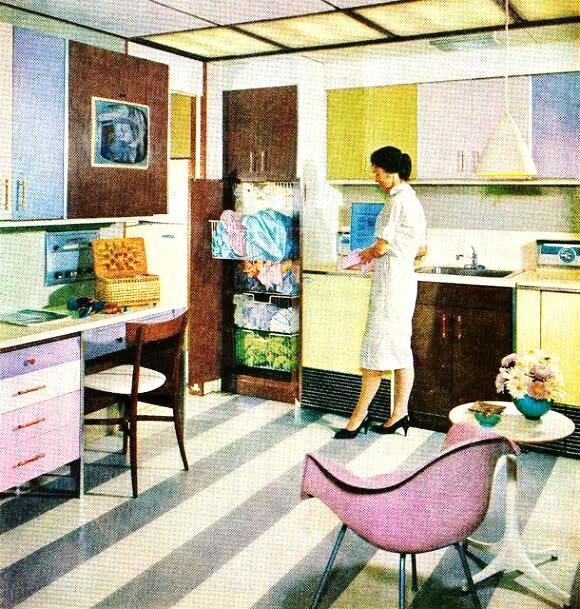 ~ Vintage kitchens.... how about some Lilac love! ~ Delphite blue... the Jeannette measuring cups!